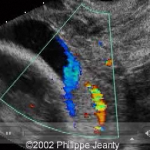 What is Colour Doppler Ultrasound? Recent studies have shown that when vasa praevia is prenatally diagnosed, and a proper management plan is followed, the infant survival rate (absent any other congenital defect) is ~100%. 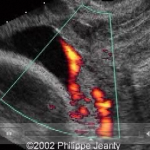 During any anomaly scan the position of the placenta and the placental insertion of the umbilical cord should be recorded (i.e. whether the cord is centrally inserted, marginally inserted, a velamentous insertion or vasa praevia etc.). 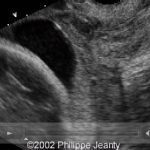 In all cases where the placenta is low lying and/or the where the insertion of the umbilical cord is not central these cases must be referred for further diagnostic testing. 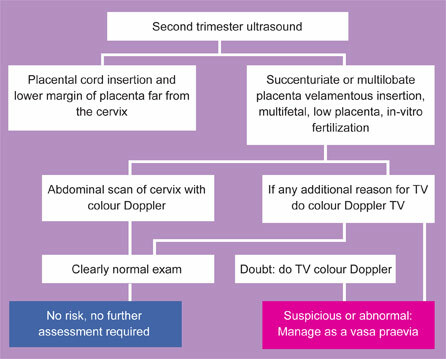 Additionally, all women presenting with warning signs or within the risk groups (see Women in risk groups) should be scanned using transvaginal colour Doppler ultrasound again to specifically locate the placental-umbilical cord connection (see algorithm below). The Royal College of Obstetricians and Gynaecologists have recently announced that they will be amending the current guidelines on the diagnosis and management of placenta praevia and placenta praevia accreta to specifically include advice on the diagnosis and recommendations of vasa praevia. Why should colour doppler be used? This is an artery with an interior velamentous insertion. Note on the greyscale there is no evidence of vasa praevia, but as the scan progresses to colour and the power doppler it is clear there is vasa praevia. Again, there is no reason not to use colour doppler during these examinations. The diagnosis would have been missed otherwise.